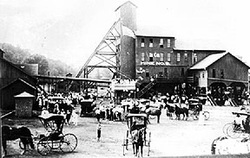 The journey begins in the year 1880 when seventeen year old Danny Myron runs away from an Ohio coal mining town to join a logging crew in the "Great Northern Forest". 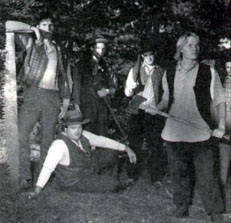 Through Danny's apprenticeship to the "haywire" crew, the lowest ranked team in the company, we meet the hardworking, hard living men whose hobnailed boots strode the virgin forest a hundred years ago. From the first the crew tells him, "There's more to loggin' than fallin' trees," and as Danny learns, there's more to being a man than fighting the biggest fella in the camp. 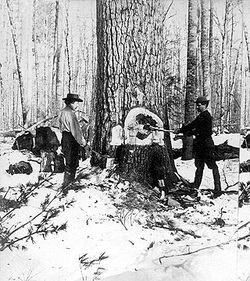 Whether Dancing with six foot crosscut saws, being lost in the frozen woods at night, finding among the trees a fictional sweetheart, or complaining of the "Bugs, bugs, bugs," Haywire sings a love story to the U.P. that will please those who live in this magical place and those visiting it for the first time.